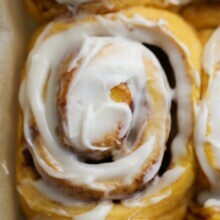 Soft, sweet and so addicting, this pumpkin cinnamon rolls recipe with maple glaze will have you and everyone you feed them to swooning. In large bowl, sprinkle yeast and 1/4 teaspoon sugar over warm water. Stir and proof 5-10 minutes. After yeast has foamed, stir in milk, butter, sugar, salt, pumpkin puree, and half the flour. Stir in flour by 1/2 cup increments. When you can no longer stir, remove dough to board and knead in remaining flour or until dough is similar to bread dough, slightly sticky but won't stick to your hands. (For me, it took me about 5 minutes of kneading and I used 5 1/2 cups flour.) Lightly grease dough ball and place into a clean bowl. Cover with a clean kitchen towel or plastic wrap and place in a warm, draft free area in your kitchen. Let dough rise for 1-2 hours or until doubled in size. While waiting for dough to rise, grease 1-9x13 pan and 1 pie plate or 8x8 square dish. In a small bowl, stir maple syrup and butter together. Punch down dough and remove to a clean, lightly greased board. Roll dough out to be 24x12 inch rectangle (approximately). Pour butter and maple syrup mixture over rolled dough and spread out to moisten entire surface. Sprinkle brown sugar, cinnamon and nutmeg over top dough and press down lightly. Roll dough up lengthwise to be a long, skinny log. Pinch edges of dough together. Using a sharp knife, cut entire log in half (to get 2). Cut those halves in half again (to get 4). Cut those halves in half again (to get 8 ) and then again (to get 16). Place rolls in prepared pans. (12 rolls in the 9x13, 4 in the other.) If some of the filling oozes out onto your board while cutting, scrape it off and place on top of the rolls to bake (we don't want to loose any filling!). Cover rolls to rise again for 1 hour or until they have almost doubled in size. Bake at 350 degrees for 20-25 minutes or until top of rolls are golden brown. (Check them after 18 minutes just to be sure you don't over bake). While rolls are baking, mix powdered sugar, vanilla, maple extract, milk and melted butter together until smooth. Spread over hot rolls and serve warm.